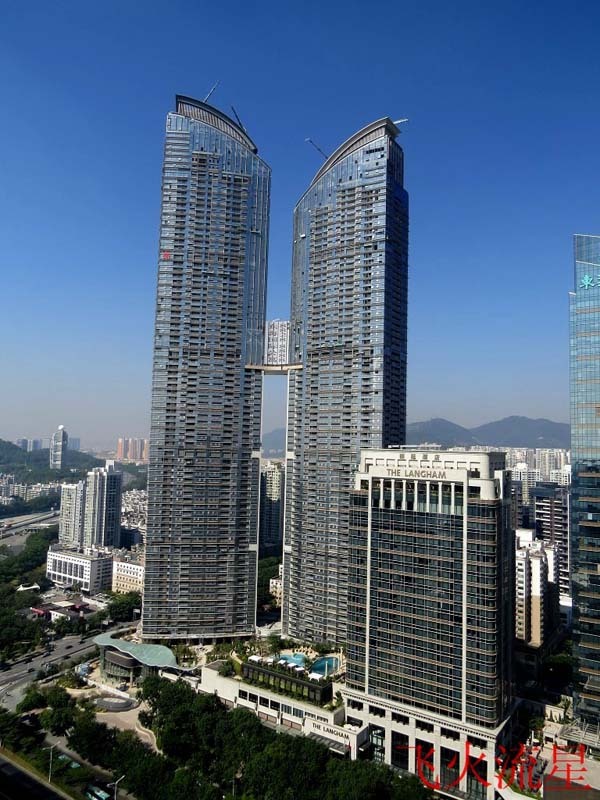 Located alongside Shennan Avenue, a major east-west thoroughfare through the heart of Shenzhen, East Pacific Center is a large mixed-use complex comprised of two office towers, a hotel tower and two residential towers. 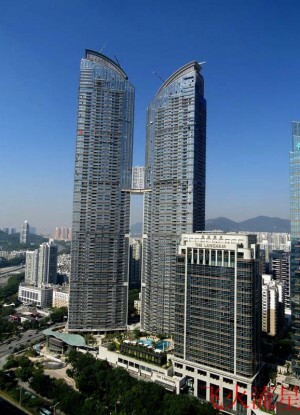 Upon completion, East Pacific Center Tower A was among the tallest residential buildings in China and stands as the tallest building within the complex. East Pacific Center Tower A has a fraternal twin relationship with the neighboring residential tower Tower B which are linked together by a three story retail podium structure at the base of the towers and also through a multi-level skybridge positioned at a height of 170 meters above the ground. The bridge houses amenities for the luxury residences, including a club house with a gym, swimming pool and a spa. The residential towers were constructed with a composite structure comprised of vertical steel columns encased in concrete making up the perimeter of the structure, as well as the core. The skybridge was constructed of hallow steel sections, weighs in at a total of 700 tones and was lifted into place largely as one piece. The inclusion of the bridge created design challenges for the team who had to factor in the rigidity of the bridge while the towers sway, especially in times of seismic conditions or extreme winds from typhoons making landfall. When East Pacific Center Tower A was completed, it was the second supertall tower to emerge from the rapidly changing skyline of the fast growing city. 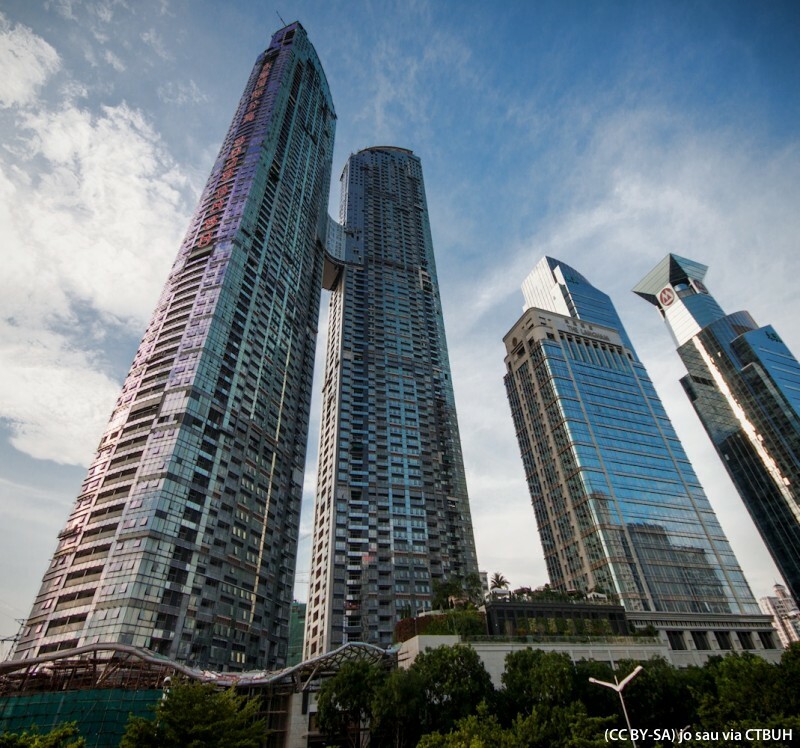 As the skyline continues to grow taller, the complex will remain a highly visible fixture in the cityscape, due to its location near Deep Bay and central location within the city which positions the towers between Shenzhen’s larger skyline nodes to the east and west.